Shark Tank is my favorite TV show, not just because I love the inspiring stories of how people from all walks of life and around the world come to the US to work hard to achieve their American Dream, but for the actionable insights the “sharks”, self-made millionaires and billionaires, offer as they analyze various investing proposals. In fact, Shark Tank has been one of the key inspirations for my own evolution as an investor over the years, along with the timeless wisdom from history’s other great investors (like Warren Buffett and Peter Lynch). So here are three valuable lessons from the show’s 10 seasons that can hopefully help you improve your portfolio’s returns, avoid some costly financial mistakes, and maximize the chances of achieving your own American dream. A lot of people watching the show are both inspired and intimidated by stories of people quitting their jobs, risking their life savings, and sometimes going deep into debt in order to start a business and chase a dream of building and growing a financial empire. But the truth is that thanks to the wonders of the stock market, we can all be entrepreneurs. In fact, the best way to think of your portfolio is as a business, because anyone investing in the stock market owns actual pieces of a company. If you invest in the S&P 500 then you own part of a financial empire with tens of millions of employees, operating in over 200 countries in every sector and industry, bringing you a small portion of that cash flow from every corner of the globe (via that paltry 1.9% dividend). Owning individual companies, which I’m personally a fan of, means that you can convert active income (your wages and salary) into passive income. Dividend growth stocks are the most direct way to benefit from this, since you frequently get a cut of your companies cash flow sent to you, either to reinvest, spend or buy other companies (and thus exponentially grow your cash flow). Think of dividends like royalties (of which Mr. Wonderful is such a fan) that will eventually recoup your initial investment. But even once you’re paid back you’ll still own your part of the company, which will hopefully increase exponentially in value as competent management grows the business’s cash flow (and your dividends) over time. My retirement portfolio is paying me $12,224 annually or, on average, $33 per day (including weekends and holidays). And that’s been growing at 13.8% annually over the past five years and almost 17% last year (all from dividend hikes). Now, I have no plans to retire anytime soon. So I constantly reinvest that cash flow stream. But the point is that a well-designed income portfolio can set your journey down the road to riches on autopilot. 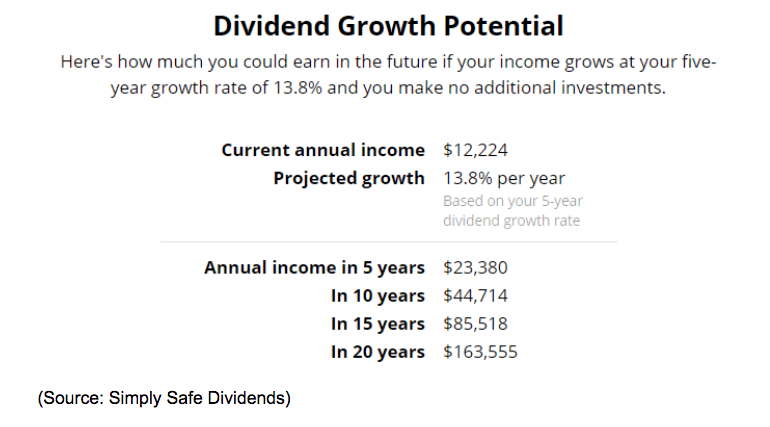 Thanks to the incredible compounding power of exponential growth and time, here’s what my portfolio’s annual dividends would grow to (not including any new investments or reinvesting the income) over the next coming years. 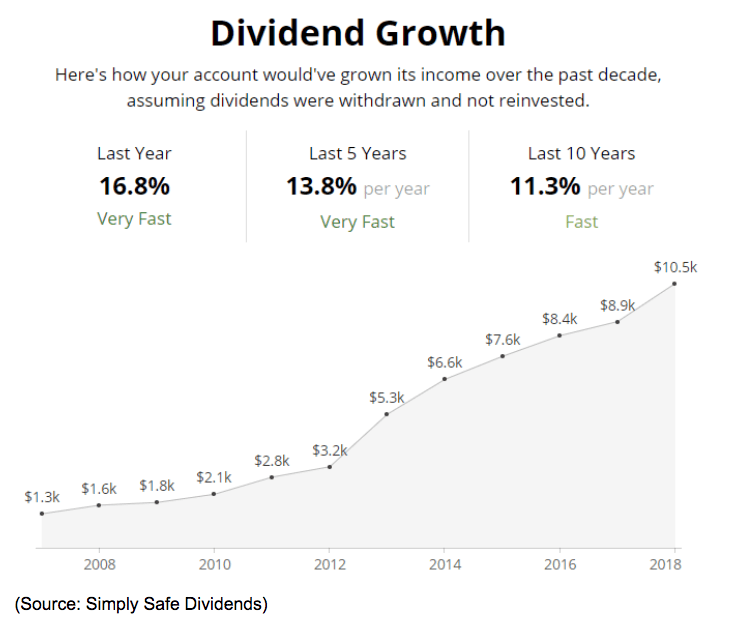 Now maintaining almost 14% annual dividend growth over time is not realistic, especially since the past 10 years have seen the longest economic expansion in history. But achieving double-digit organic dividend growth (from payout hikes) is an attainable goal for those with the skill to choose a good collection of companies at great prices whenever the market offers them. But just as with any business, you have to adapt over time. That’s because, while ETFs that own popular indexes like the Dow Jones Industrial Average or NASDAQ are an easy hands-off way of putting your money to work for you, there is more to good investing than just buying an ETF or a popular stock and sitting back and doing nothing. Yes, the purpose of investing is to let your hard earned money work even harder for you. But whether you’re an active investor (stock picker) or passive (index fund) investor, you also have to think ahead and adapt to changing market/economic conditions. Just as businesses must always overcome challenges, so to must you deal with inevitable periods of fear, uncertainty, and doubt. That includes inevitable recessions, which, since 1946, have always meant bear markets. 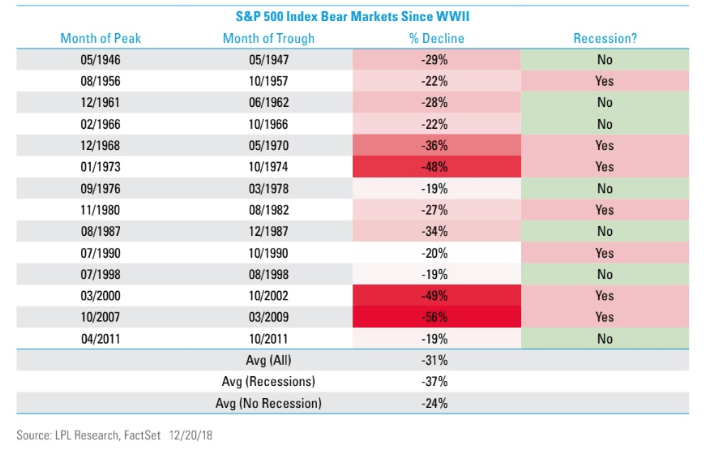 The average recessionary bear market sees stocks fall 37% from all-time highs, and generally over a period of 13 to 17 months. Such a drastic drop in a short but miserable period of time is a big reason that average investor returns are so terrible (akin to 90% of new businesses failing). Over the past 20 years, the average investor would have made almost double the returns investing in risk-free bonds as they actually did thanks to horrible market timing in stocks. For the average person, the best way to avoid such a grim financial fate is proper asset allocation, meaning the right mix of cash equivalents (like T-bills) and bonds, in addition to stocks and stock ETFs. 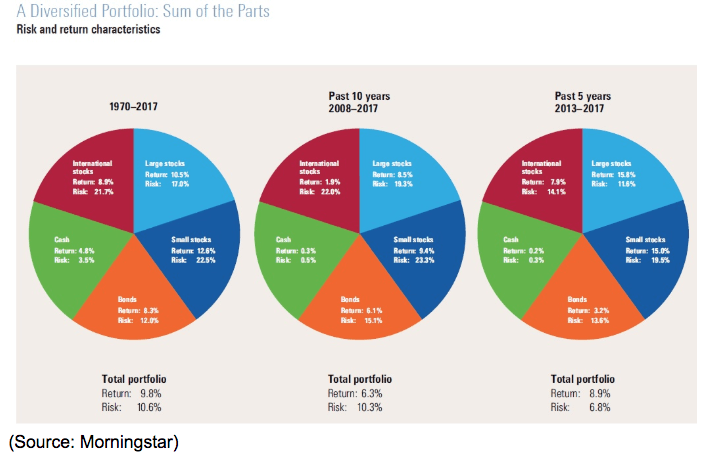 Above is a model diversified portfolio from Morningstar. 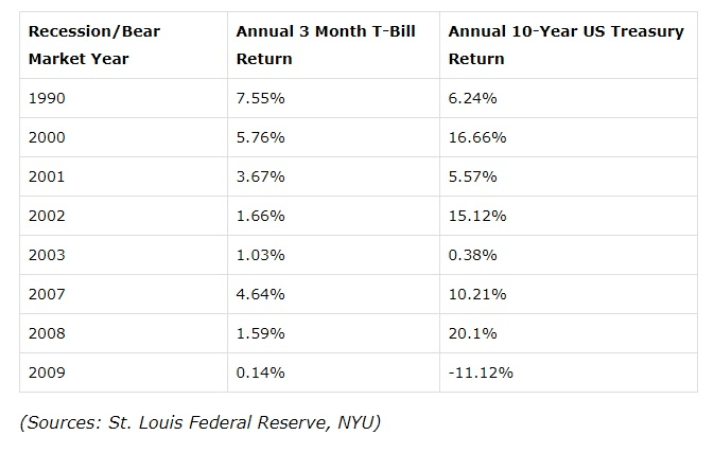 Despite owning a lot of cash and bonds, it’s been able to achieve long-term returns of 9.8%, essentially matching the S&P 500, but with far less volatility over time. That’s thanks to cash and bonds being countercyclical to stocks, meaning they rise during recessions and bear markets. But note that this model portfolio is a buy and hold a portfolio that avoids selling stocks before a recession, which is something I also recommend for all my readers and plan to do myself. History is very clear that asset allocation and portfolio construction is the way to protect your money from market downturns, not market timing. Capital allocation, meaning what you do with new money that’s coming in, is the appropriate way you can adapt to shifting market/economic conditions. Which brings me to the second important Shark Tank investing lesson. Anyone who watches the show has probably noticed that each Shark has expertise in certain industries and some they just want to avoid entirely. Usually, it’s because the economics of an industry (like clothing) is brutally competitive and they have lost money on past ventures. This is a good example of Peter Lynch’s famous quote “invest in what you know”. Lynch, who ran the Fidelity Magellan Fund from 1977 to 1990, delivered 29% CAGR total returns over those 15 years, which is one of the best investing records ever achieved. Lynch was specifically talking about avoiding taking high-risk investments into sectors or industries that you have no competitive advantage in, because they are, as Buffett would say “in the too hard bucket”. Small cap biotech is one example of a high-risk industry where tiny startups are racing to develop one or two blockbuster drugs before their cash runs out (they are often pre-revenue). If they succeed they can sky-rocket 300%, 400% or over 500% in a year and then get bought out by a pharma giant for an even greater premium. But the world of drug development is extremely complex and risky, with about 1 in 10,000 new potential treatments ultimately making it to market (after a 10 to 15-year approval process that costs on average over $800 million per drug). I personally avoid small-cap biotech, and in fact only invest in blue-chip drug makers precisely because they have the financial resources to overcome inevitable drug failures and still maintain and grow their dividends (I want my capital returned to me after all, and then some). And like the Sharks, I too have industries that I won’t touch, because their economics are just not conducive to my preferred investing approach/goals. You don’t have to own companies in all industries or sectors to be successful. Most investors will do well with 20 to 30 individual companies in 9 to 11 sectors and can use ETFs to gain exposure to assets/sectors where they lack expertise. MINT is where I store my savings and dividends when I’m waiting for my limit buy orders to fill. It yields 2.6% after expenses, pays monthly, and is flat as a pancake, because of the assets it owns and how well it’s run (as a cash equivalent). VGLT is a mostly 30-year US Treasury ETF that is where I put new money and dividends when the yield curve indicates a recession is likely coming soon (within 8 to 16 months). Remember when stocks are falling long bonds are rising (flight to safety and falling rates plus possible Fed QE) which means that my bonds will give me something to sell when the market hits -20% and Wall Street will be ripe with top quality companies trading at their lowest valuations in five to 10 years (or more). Remember that this kind of long-term planning, in terms of what you’re doing with your current savings and dividends, based on portfolio rebalancing (to maintain proper asset allocation), market valuations and economic fundamentals, is also part of running your portfolio like a business. But by far the most important investing lesson Shark Tank teaches is about risk, which is by far the most valuable to you, me, and our portfolios. All good investors, including the Sharks, focus on risk first and foremost. That’s why most of the 10-minute segments (edited down from 30 min to 2-hour pitch sessions) has the potential investors grilling entrepreneurs about their competitive advantages (like patents) and how they plan to inevitable adapt to challenges to their ambitious growth plans. That also applies to the stock market. Since 1980 ⅔ of companies have underperformed the broader market (Russell 3000) and 40% of firms have delivered 70+% permanent losses. A handful of successful blue-chips generate almost all of the market’s impressive returns. This is why risk management is so important and why I personally focus mostly on high-quality blue-chips (level 8 or higher on my proprietary 11 point quality scale). While even the biggest blue-chips can eventually fail, the odds are far higher that proven winners, benefitting from a good corporate culture, competitive advantages and economies of scale will keep on winning. More importantly, companies with great dividend track records (like dividend aristocrats and kings) are most likely to adapt successfully to changing industry conditions, which are a constant in the cutthroat world of capitalism. Blue-chip dividend stocks are the very corporate giants the Sharks warn pitchers will “crush you like a cockroach” and I personally want to have my money invested with the firms most likely to keep delivering me safe and rising dividends over time. Even the best investors in history are often wrong, up to 40% of the time. The key is to limit realized losses on those mistakes. That’s both through risk management (diversification, position size limits) and recognizing when the thesis has broken and it’s time to sell before the wheels totally fall off the bus and the stock plummets to those 70+% losses shown in the above chart from JPMorgan. Personally, since I’ve adopted tighter risk management and a mostly blue-chip focus, my success rate (over the past 2.5 years) has risen to 75%, far above the Lynch 60% hurdle rate for good analysts (putting me in the top 0.5% of all analysts according to TipRanks). Only time will tell if I can maintain that over decades, but as Shark Tank shows, if you are disheartened with your portfolio’s returns it’s probably because you’re taking too much risk, rather than too little. The other part of risk management is valuation. Buffett famously calls valuation his “margin of safety” because stock returns aren’t necessarily based on absolute growth but on growth relative to what’s priced in. 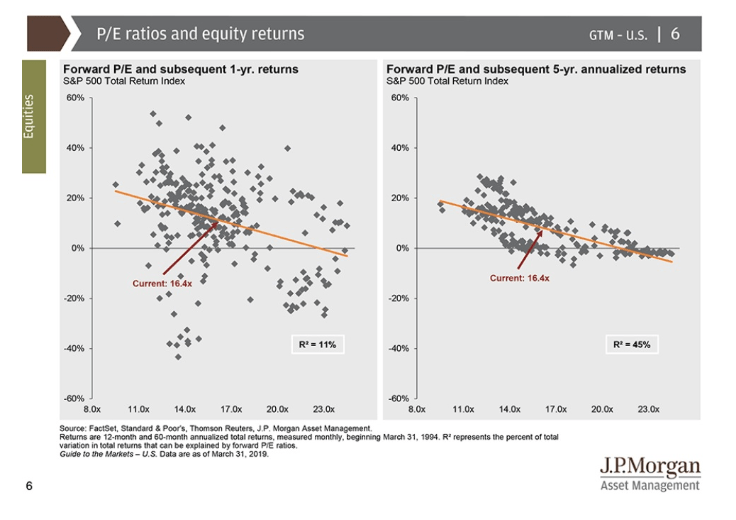 Since 1994 45% of the broader market’s returns have been explained by starting valuation (in this case forward PE ratio). Basically, you can think of valuation, whether in terms of yield, price to earnings or price to cash flow, as a good indication of what long-term growth is priced into the stock and thus the hurdle management needs to clear to deliver multiple expansion and big gains in the years ahead. I am a big fan of Buffett’s rule that “it’s far better to buy a wonderful company at a fair price, than a fair company at a wonderful price.” Of course, buying a wonderful company at a wonderful price is even better, which is why I’ve spent the last five years constructing a watchlist that now not just ranks all my companies by quality (so I know what’s a blue-chip worth owning) but also tracks the price relative to my target buy price (where I set my buy limit orders). This allows me to set my limits and run my portfolio on autopilot. Right now I have $2,000 buy orders set on 14 blue-chip stocks, at prices that are between 9% and 50% below historical fair value (based on dividend yield theory, the most accurate blue-chip valuation method since 1966). The average order is 25% undervalued and most will likely not trigger. But those that do will leave me with ownership stakes in great companies at terrific prices that could deliver between 12% and 26% annualized total returns over the next five years (average total return potential is 18% CAGR). That’s compared to the market’s 9.1% historical return, and 1% to 7% expected by most analysts from the S&P 500 over the next five years. As Kevin O’Leary, aka “Mr. Wonderful” is fond of saying “I’m just a disciplined financial investor.” Well so am I and my biggest gains have all come from patiently waiting for the market to meet my price, rather than chasing “hot stocks” via a TINA (there is no alternative) or FOMO (fear of missing out) mentality. 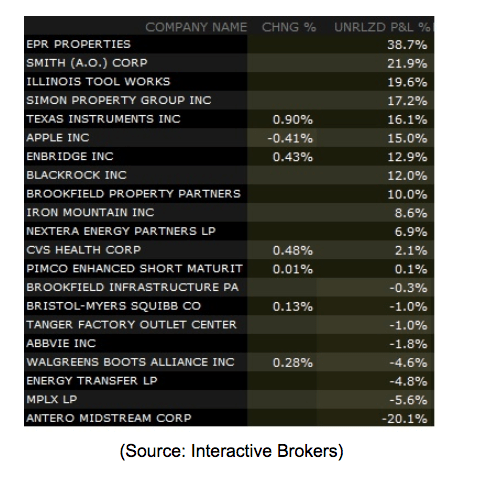 Here’s a list of my retirement portfolio holdings ranked by unrealized capital gains. The biggest winner is EPR Properties, a REIT I bought heavily (lowering my cost basis with ever lower limits) during early 2018’s correction. That was the bottom of the 2016 to 2018 REIT bear market. Since then REITs have not just recovered but become a Wall Street darling once more. Simon Property Group, a Class A mall REIT has also delivered outstanding returns over the past 12 months since I bought it (over 20% including dividends). A.O Smith and Illinois Tool Works I picked up in the most recent correction, as I did BlackRock, Texas Instruments, and Apple. Notice how over time I’m using periods of peak market pessimism, either for the entire S&P 500 (corrections) or for individual sectors, to pick up quality names at dirt cheap prices. I’m not trying to pick the very bottom, just get great companies at great prices. If they fall, I keep setting limits and buying more at even better prices as long as I have the money. Thus I keep lowering my cost basis and generate even bigger future returns, both in percentage terms and an absolute dollar amount. Recently I’ve been buying hated healthcare blue-chips and they may end up languishing for all of 2019 and even into 2020. Midstream and REITs also spent years in the toilet but ultimately as long as the quality of a company is good and its fundamentals move higher over time, the share price is sure to follow. The key is to be confident in your companies (good watchlist) and then buy fearlessly when the future return potential is highest (be “greedy when others are fearful”). If you follow these simple Shark Tank (and other legendary investors) inspired tips, then you’ll likely hit that Peter Lynch 60% success rate and over time achieve the kind of great returns and strong dividend income that can help meet your long-term goals. Watching the show and following these tips can’t make you an overnight millionaire, any more than reading a book about Warren Buffett can. But I’ve personally found that the best way to improving my portfolio’s returns has been to “stand on the shoulders of giants” and follow the lead of proven winners. While none of the Sharks is perfect, that’s also true of all investors, including the greatest legends of all time. Rather the key to the incredible success these entrepreneurs/investors have had is learning to overcome challenges, manage risks, and steadily build on the disciplined time tested strategies that let the incredible power of compounding make their money work for them. The more I apply these time tested investing principles from the show to my own investing strategy, the better the results become. And I’m confident that if you do so as well in a patient and disciplined manner, you’ll also achieve far better results in your own investing endeavors.